Every minute around 257 babies are born. How are their brand new minds shaped? And are the infants who laugh really the ones getting the joke? Broadcast 9 July 2014. Tiny babies are, from birth, active learners. They don’t wait for the world to come to them. Claudia Hammond explores the very latest research about what influences the developing mind of the new born infant. 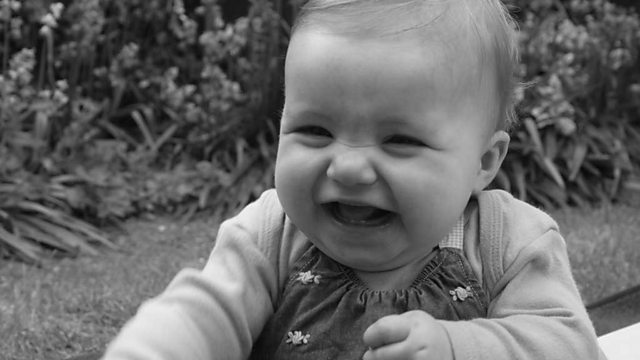 Dr Caspar Addyman from the Babylab at Birkbeck, University of London, describes the biggest ever internet survey of babies’ laughter, which concludes that babies really do get the joke. Professor Celeste Kidd and researchers from the University of Rochester in the US reveal that just like the fairytale, Goldilocks, babies will focus their attention on things that are “just right”. As Goldilocks chose the porridge, the chair and the bed that suited her perfectly, the inquisitive infant will choose exactly the right level of stimulation and interest - too complicated, and they look away, too simple and they lose interest. During the first year of life, the development of both the brain and the rest of the nervous system is hugely affected by babies’ nourishment - a sobering fact when you consider that 165 million children are undernourished, according to Unicef. This shortage of the right nutrients can have lifelong effects and Dr Sophie Moore from the UK’s Medical Research Council’s International Nutrition Group reports form The Gambia, from the MRC field station in Keneba. Sophie and Dr Sarah Lloyd Fox from the Centre for Brain and Cognitive Development at Birkbeck describe the work being done to find early warning systems to raise the alarm before poor nutrition causes stunting and affects brain development. And, one of the world’s leading authorities on infant communication, emeritus professor of Child Psychology and Psychobiology at the University of Edinburgh, Colwyn Trevarthen, talks to Claudia about the importance of talking to babies, and the musicality in those communications. A crucial guide to the things that affect us all. Hear from those with first-hand experience, and experts in the field.